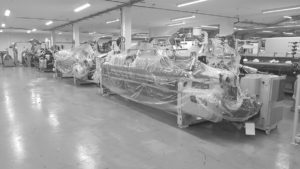 Arville has begun 2019 by taking delivery of three new high-speed weaving looms – the first part of a suite of new machinery worth over £1.2m. The rapier-style looms have been shipped in from Europe, and will contribute to a significant expansion of production capacity at our Wetherby site. Three more such machines will be added to our factory later this year, as well as specialist warping equipment, which will further boost the speed and output of our weaving capabilities. The Picanol OptiMax looms have been installed and are undergoing commissioning by engineers to make them ready for work. Further specialist training will follow on for our dedicated weaving team on the finer points of their use before they are fully integrated into the existing fleet of looms. Group Head of Marketing for Arville, Andy Smith, said: “The new looms will give a welcome boost to our production of bespoke textiles which are used in demanding applications across a wide range of sectors including defence, aerospace, automotive and pharmaceutical industries. “We are looking forward to using them to achieve great results, as we continue to develop ever lighter, stronger and more sophisticated fabrics. Recent years have seen Arville experience record levels of successive double-digit growth and the planned investment will help to keep the business growing at a pace with customer demand. Arville’s strategic aim is to position the business as a ‘best-in-class’ specialist in the design, weaving, finishing, coating and fabrication of technical textiles.